Since writing my last post on “Heart Rates and Other Measures of Fitness“, I stumbled on an old article which challenges the Maximum Heart Rate Theory from The New York Times. I was re-reading an old post I wrote about my early flycycle experiences just to see how far I’ve come and noticed that I had a link to this article. I don’t even remember reading it but boy did it have some great insights! Finally! Some real evidence to challenge the Maximum Heart Rate formula (220 minus your age). It turns out that the formula was devised on the fly based on limited data that was potentially flawed and not representative of the general population. The formula was never intended to be a prescription for the general public, but such was the desire for an easy way to determine how hard we should work out that it fell into mainstream use. In my previous post on Heart Rates, I talked about #FMR’s slow and steady heart (where his heart pushes out large volumes each time it contracts) versus my hummingbird heart (which contracts at a faster rate but squeezes out less blood each time). I thought then that it had something to do with my lack of exercise in my youth, but it seems that even professional athletes can have hummingbird hearts. An average healthy person’s heart rate drops about 20 beats in a minute. The rates of athletes can drop by as much as 50 beats in a minute. In his studies, people whose rates fell less than 12 beats within a minute after they stopped exercising vigorously had a fourfold increased risk of dying in the next six years compared with those whose heart rates dropped by 13 or more beats. So the stats that I should really be paying attention to is the heart rate taper at the end of a workout. As long as I’m dropping by more than 13 beats in the minute, I’m good! Out of curiosity, I did an impromptu test in the gym when I took G1 for his run. I did six rounds of slow/moderate/fast runs, then checked how quickly my heart rate dropped. It was most consistently about 23 beats. There were some limitations in this test, though. Firstly, I wasn’t wearing a heart strap and the Garmin watch measure against my wrist has proven to be inaccurate in the past. Secondly, I didn’t run for very long – each round was only 6 minutes long. If I had done 10 minutes or 20 minutes, would my heart rate drop less? Thirdly, I didn’t come to a complete stop after each sprint. I only slowed the treadmill to a walk. Would my heart rate have dropped more if I had stopped? Finally, it wasn’t a full minute because the machine take several seconds to slow down, during which time, my heart is still being taxed. After that little gym test, it finally dawned on me that I had all the stats I needed from my Garmin! The image below was taken from today’s flycycle workout. 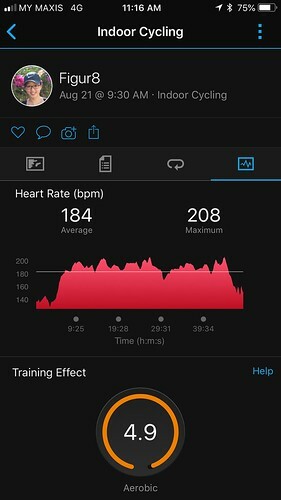 My heart rate at the end of the workout – which isn’t marked, but you can see its peak – was 207 bpm. After a minute, it dropped to 184 bpm. That’s 23 beats. I guess my little gym test wasn’t too far off after all. Since I have all my workout stats from the last two years, I could go back and check if there has been an improvement in how quickly my heart rate drops after a workout! It’s getting late so I’ll have to save that job for another day.